If you wish to draw Support and Resistance lines, view: daily market opening, classical pivot levels, Fibonacci pivot levels, trend lines, Fibonacci levels, the remaining time to candle closing, and current spread. If you seek to place your orders with the exact lot that meets your desired stop loss risk. If you wish to do all this and more with just one click, then this is the perfect tool to use. 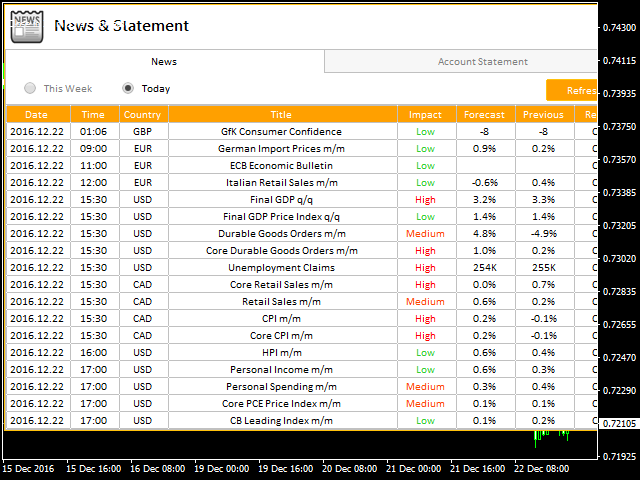 This tool will allow you to feel more relaxed when deciding to open orders, as well as predicting your profit/loss. with Personal Assistant Tool Placing orders is very precise and professional like. Limitation: This demo version works only on the CADJPY pair, shows only low-impact news, account statement loads only first 10 trades. This panel is used to calculate the required lot that meets your accepted stop loss risk. You will be able to choose a specified risk percentage of balance or equity that you accept to lose at that stop loss point the tool will auto-calculate required lot. Then, with just a click the order will be sent immediately. Risk: this percentage can be chosen based on balance or equity, showing the sums of money being risked. SL & TP: manifests pips and funds that will be either gained or lost. Ratio: calculate the percentage of profit to loss, different percentages can be chosen: double, triple, etc. Max Lot: shows maximum lot based on risk percentage. Market Order: if ON the order is market, otherwise it’s stop order or limit order. 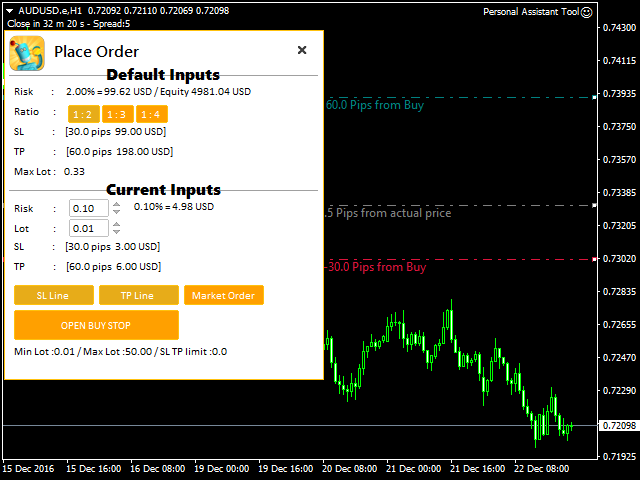 Order Dragging feature: horizontal lines will be viewed on chart representing levels, these lines can be selected and dragged to adjust order EP/SL/TP, the order type will be auto selected. Open At Time Button: with this Button you will be able to place an order at specific time, if you enable Market Order mode, the order will be Market order, otherwise its will be Pending Order, choose lot size, SL, TP, press open at time button and choose the time then click put line Button the EA will place a line at the time you choose. All these options can be modified according to need. 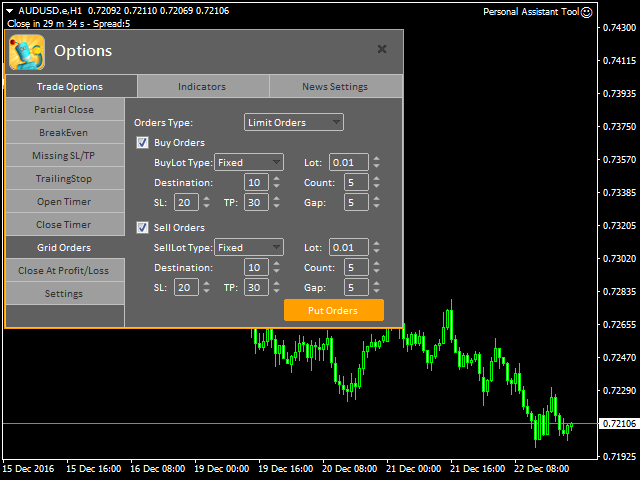 Trade Options: this section has many future Partial Close, Breakeven, Trailing Stop, Missing Stop, Close all Order at specific time and an options to change orders Line style, color and width. Indicators: in this section you will be able to use pivot, Fibonacci, trendlines, shows daily open line and show grid on the chart. News: this section shows the economic calendar you can choose the impact, pairs, and alert before news send notifications to mobile and email. 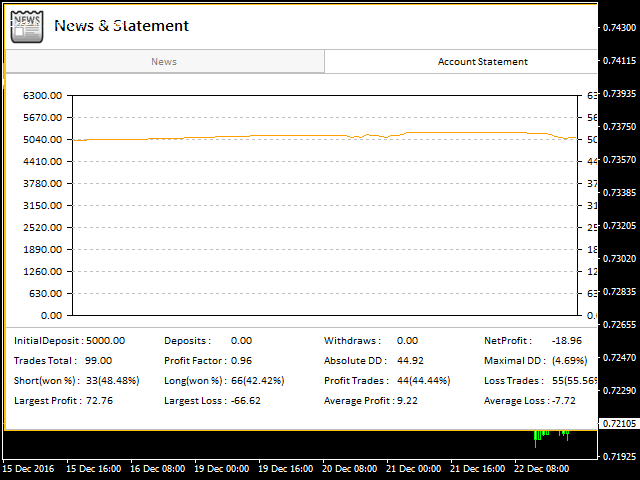 Account statement: This section helps overviewing your account statistic in the current time, which includes Buy orders, Sell orders, Winning orders, Losing orders, Total percentages losing, winning orders. D button: shows daily open line. V button: shows Fibonacci pivot levels. P button: shows pivot levels. 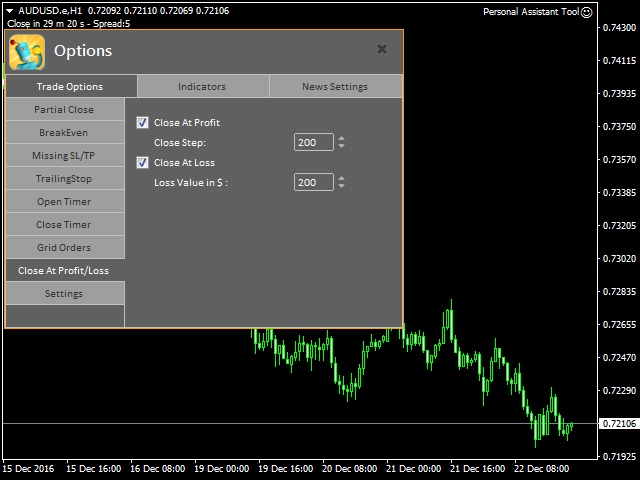 F button: shows Fibonacci levels based on the bar in screen. T button: shows trend line based on the bar in screen. O button: shows options panel. A, Q buttons: to draw support and resistance with two different style just move your mouse pointer and click these buttons and you got it. B, S buttons: placing buy or sell order. Note: You must add http://www.forexfactory.com URL to Options -> Expert Advisors -> 'Allow WebRequest for listed URL' in order to let EA load news data from the source. Feel free to give your opinion about the tool, and please inform me of any improvements needed to be done.